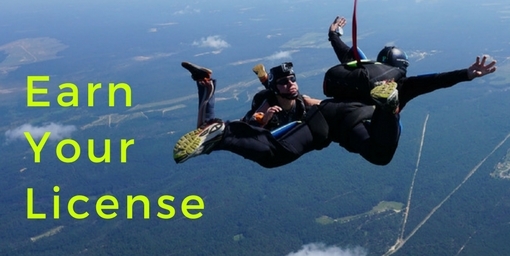 Whether you’re a complete beginner or have just bagged that triumphant first tandem experience, it’s helpful to stroll into the sport of skydiving armed with a little bit of information. You don’t need to be a daredevil to do this, but you do need to be a smart cookie. This quick rundown on skydiving classes–known in the skydiving world as AFF (“Accelerated Free Fall”)–will help you understand what these classes are, how they work and what they’re meant to achieve. At the heart of the AFF training program is the prioritization of student safety. The program moves in an eight-stage progression from absolute simplicity onward, ensuring that the student is confident with his/her emergency procedures and only progresses to the next level once the skills of the current level are well-learned. This step-by-step process starts on the ground. The program starts each AFF student in “ground school,” where students review the gear in detail, discuss malfunctions, use hanging harnesses to review emergency procedures and build theoretical knowledge. It’s very similar to a first-time drivers’ course, in that students aren’t put behind the wheel before they’re given a few hours of technical instruction. A student’s first AFF jump is very exciting for everyone involved–student, two instructors, and videographer alike. The jump itself is simple by design, asking the student to demonstrate awareness, stability and the capacity to deploy his/her own parachute. At this stage, students don’t really need any more challenge than that–it’s stimulating enough to just be there. Walking into this challenge, it’s important to understand what it’s all about. The overall goal of an AFF program isn’t perfection. It’s not even mastery. It’s all about safety, and it’s simply meant to advance an absolute beginner skydiver to the point where he/she has the skill set to safely make solo skydives. Once certified, the new skydiver may advance his/her skills in a multitude of ways, with qualified coaches in a range of disciplines–as well as share the sky with friends. It’s also about earning the paperwork that allows you to make skydives in other places. Every dropzone requires skydivers to present at least an A-license–which you earn upon AFF graduation–in order to make a skydive. Your A-license, then, is like a passport to unique slices of sky all over the world! Our best advice to new AFF graduates is this: Stay active and keep current. The number-one reason that new skydivers drop out of the sport is that they allow too much time to elapse between jumps. Staying current, in a very real way, protects you and protects your AFF investment, so do it! If you have specific questions about skydiving classes offered at Skydive Paraclete or additional information on what to expect, don’t hesitate to ask us. We’d love to answer them!